OnePlus today began pushing OxygenOS 4.5.7 to the OnePlus 5 smartphone, introducing new features while also installing updates, optimizations, and bug fixes. Additions include an all-new font called OnePlus Slate. More importantly, 4K video capture gains access to electronic image stabilization. OxygenOS 4.5.7 updates the OnePlus 5 to the July 1 Android security patch and includes the latest GMS package. As for optimizations and bug fixes, the new operating system improves WiFi connectivity and standby battery performance, while resolving sound leaks in the speaker, shutter bug sound issues, and missing sound channels in recorded video. OnePlus says OxygenOS 4.5.7 will reach some OnePlus 5 owners beginning today, with more receiving the update in the days ahead. Mint SIM today rolled out a new service plan offering that encourages customers to buy wireless access in multi-month bundles. Mint SIM now has nine different options for customers. The entry-level service plan includes unlimited talk and text with 2 GB of LTE 4G service. Mint SIM also offers a 5 GB plan and a 10 GB plan. Each of the 2 GB, 5 GB and 10 GB plans needs to be purchased in 3-, 6-, or 12-month bundles, and paid in full up front. For example, the 2 GB plan is available for $15 per month for three months, but requires an immediate payment of $45. Customers can buy the 2 GB plan for 6 months for a total of $108 up front, or for 12 months for a total of $180 up front. The 5 GB costs $60, $144, or $240 for 3, 6, or 12 months, respectively, and the 10 GB plan costs $75, $180, or $300 for 3, 6, or 12 months, respectively. Mint SIM is an MVNO that runs on T-Mobile’s network. Customers can use their own unlocked GSM handset, or purchase a device directly from Mint SIM. Mint SIM is also launching a SIM card bundle at Best Buy stores. Customers can pick up a Mint SIM card for any of the nine bundled options at Best Buy retail locations in the U.S. and pair it with their own unlocked handset. Mint SIM would not say what the top 4G LTE download speed available to customers is, but it does throttle those who exceed their monthly data limit to 128 Kbps. The new Mint SIM service plans are available beginning today. Samsung has a lot riding on the success of its Galaxy Note 8 in light of last year’s costly recall of the fire-prone Galaxy Note 7, which led to losses in the billions. After tracing the Note 7’s problems to two key battery defects, the company has since tried to salvage some of the millions of recalled phones by refurbishing and rebranding them in South Korea as the Galaxy Note FE. Late yesterday and early today, mobile tech writer Evan Glass, who has published numerous accurate leaks about other devices in the past, posted several images on Twitter that appear to show front, back, and side views of the Samsung Galaxy Note 8 (product images, shown above). In addition to showing a stylus accessory, the photos reveal a phone with a curved side edge, “Infinity Display,” and a rear fingerprint sensor to the side of the dual camera lenses. According to Blass’ tweets, the Galaxy Note 8 will come in at least three colors: silver, midnight black and deep sea blue. Ride-hailing service Lyft carried more passengers through June this year than it did in all of last year as it capitalized on missteps by Uber. Ridership through June surpassed the record 162.5 million rides it gave in all of 2016, Lyft said Monday. A spokeswoman wouldn’t give an exact number. The company has made its gains as some people avoid Lyft’s much larger rival, Uber. Both companies are based in San Francisco. Uber has been without a CEO since June when company co-founder Travis Kalanick stepped down under pressure from the board. The departure took place after investigations by outside law firms uncovered widespread sexual harassment at the company. Kalanick also was captured on video in a profanity-laced tirade toward an Uber driver, and the company is under federal investigation for allegedly using software to thwart city inspectors who were trying to monitor its drivers. And finding a replacement for Kalanick has not gone smoothly. The reported front-runner, Hewlett Packard Enterprise CEO Meg Whitman announced on Thursday that she would not take the job. Media reports say some board members are now talking to outgoing General Electric CEO Jeffrey Immelt. The New York Times reported Monday that Kalanick may attempt to regain an operational role in the company he helped to create. Lyft wouldn’t comment on Uber but says it added 160 U.S. cities this year. The company operates only in the U.S.
Uber says it’s given more than 5 billion rides worldwide since 2010. Lyft confirmed its 2017 ridership numbers for the first time Monday while announcing the appointment of a new board member. Former Obama administration senior adviser Valerie Jarrett is the board’s 10th member. She was assistant to the president for public engagement and intergovernmental affairs for his entire term, according to Lyft. I’ll be honest, What I know about a Mac can probably be written on the back of a postage stamp. So, when a friend who lives quite some distance away asked me about their Mac, I was a bit stumped. Somehow, and don’t ask me how, they’d managed to delete some precious photos of their daughter taken on an Android phone and were looking for an Android data recovery solution or some sort of Android data recovery software. As with everything, I quickly turned to Google. It pointed me to something called Disk Drill. It’ll do data recovery for Mac, plus it’ll recover deleted text messages, tell you how to retrieve deleted text messages from Android and recover files plus deleted data from the internal memory or the SD card. A little caveat, your device does need to be rooted and it’ll need to support USB Mass Storage Mode. Although some phones can be tricky to “root”, the app will guide you through this process. Luckily I’d rooted his phone on a previous visit, and as I was several hundred miles away it was good to see an app that fitted the bill. You can either run a “Deep” or “Quick” scan on your phone and then hit the “Recover” button or do a more advanced partition search on the device in question to recover those badly-needed files. Text messages, photos, videos, music files, call logs, downloaded documents and more. It’ll also help if you’ve got a corrupted SD card, which is something I’ve had in the past too. You can get more info on the product to begin and recover deleted text messages plus any data held on your Android phone. 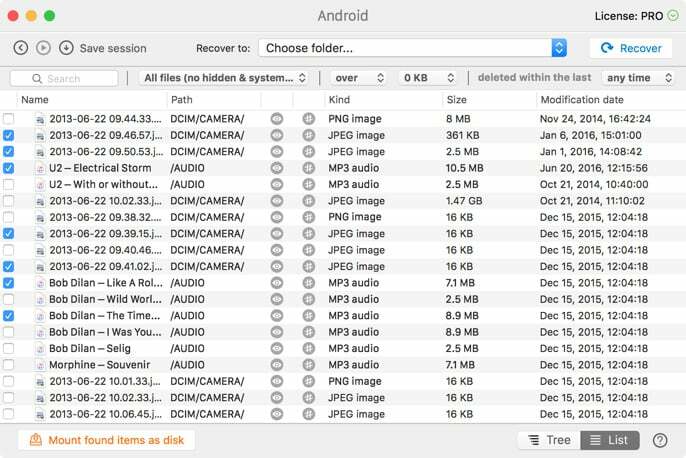 The basic version of this Android data recovery software is completely free, but if you want to get the Pro version (which adds the ability do the quick and deep Scan, search partitions and rebuild the HFS+ catalog), it’s $89. The post Got a Mac? Retrieve deleted files and text messages from your Android device is original content from Coolsmartphone. If you see it on another news website, please let us know. Sony’s fiscal first quarter profit nearly quadrupled from a year earlier, boosted by its lucrative image sensor and other businesses and highlighting a gradual recovery at the Japanese electronics and entertainment company. Sony Corp. reported Tuesday an 80.9 billion yen ($735 million) April-June profit, up dramatically from 21.2 billion yen the same period a year ago. Quarterly sales gained 15 percent to 1.86 trillion yen ($16.9 billion). Sony, whose sprawling business spans finance, movies, video games and consumer electronics, is seeing better results at its various units, including games, imaging products, semiconductors and home-entertainment systems. Tokyo-based Sony, which makes the Spider-Man series movies and the PlayStation 4 game console, stuck to its annual forecast for a 255 billion yen ($2.3 billion) profit, up dramatically from 73 billion yen posted the previous fiscal year. Also helping Sony’s bottom line was the absence of the damage it suffered from the April 2016 earthquake in southwestern Japan that shut down its semiconductor plant, and gains from insurance recoveries related to that quake, it said. Sony was long an iconic Japanese brand, symbolizing the nation’s spectacular rise after its defeat in World War II, but it fell behind powerful rivals like Samsung Electronics Co. of South Korea and Apple of the U.S. in flat-panel TVs, smart devices and other gadgets. The Tokyo-based company has found it hard to do well constantly in all its sectors, but it has shifted to focusing on businesses where it can turn a profit. It has been reshaping its business by focusing on high-end cameras and video games and selling assets, including its Vaio personal computer business. Its TV division lost money for years but has recently recovered. PlayStation 4 sales and the contribution from Sony’s Virtual Reality headsets have helped rebuild Sony’s reputation for combining technology and entertainment prowess. Google today added a new tool to image search that should help clarify what type of content is available within the individual search results. Moving forward, people will begin to see small badges in the bottom left corner of image results that indicate what’s behind the image. For example, an image search for “cupcakes” may include pictures, recipes, videos, and more. The badges will call out the image category, providing some clarity on what will happen if you tap the image. Tapping a photo marked “recipe” will open a search result with cupcake recipes, and so on. Google says some image search results may be marked as videos, products, or as GIFs. The new badge tool is being made available to Google image search on Android and the mobile web. Sprint said Tuesday that it should be able to “strike a deal” in the “near future,” driving up shares of the fourth-largest U.S. wireless carrier. The Overland Park, Kansas, company also posted its first quarterly profit in three years as it cut costs. Earlier this week, cable company Charter said it was not interested in buying Sprint after published reports said Sprint had proposed an acquisition by Charter. Claure said he was “a bit surprised” to see that announcement and that Charter talks were part of a “bigger play.” The company is having discussions with other companies, he said. A deal with rival T-Mobile has long been predicted. Sprint has long sought a deal as it is unprofitable and the wireless market has gotten more competitive. Most Americans already have a cellphone, and carriers have been trying to lure them with discounts and the return this year of unlimited-data plans. Sprint has offered some big promotions recently, like a year of free service. In its latest quarter, Sprint added 88,000 customers that pay a monthly bill, its most lucrative customers, versus 173,000 the year before. It gained prepaid customers compared with a loss the year before. Samsung’s Galaxy S8 and S8+ are now compatible with Google’s Daydream virtual reality platform. According to Google, an update should reach both handsets this week that initiates Daydream services. Daydream is Google’s VR program that brings together content from varied sources, such as YouTube, Netflix, CNN, and much more. It requires two separate apps, including Google Virtual Reality Services and Daydream. Daydream content is accessible only from Google’s own Daydream VR headset. The S8 and S8+ are already compatible with Oculus VR content and the Samsung Gear VR headset.